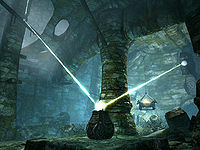 Find Meridia's Beacon and use its light to cleanse her temple of undead. Find Meridia's Beacon or find the Statue to Meridia. Bring Meridia's Beacon to the Statue to Meridia. 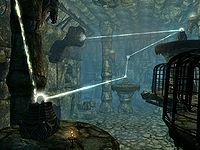 Guide Meridia's Light through the temple. The Lady of Infinite Energies, Meridia, is a Daedric Prince associated with the energies of living things. She is known for her hatred towards the undead of any kind. 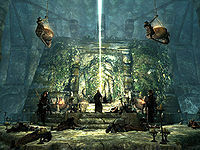 While the shrines for most other Daedric Princes in Skyrim have been hidden away in remote areas, Meridia has been given an accessible and fully intact shrine with a temple underneath. Recently, a foul darkness desecrated the temple and as such, Meridia is looking for a new champion. There are two ways to begin the journey towards becoming her champion: either find Meridia's Beacon or find the shrine. 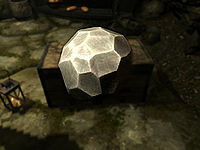 The Beacon can spawn randomly in any boss chest in the game—including those added by Dawnguard and Dragonborn—amounting to over one hundred fifty possible locations. If you happen to find this beacon, as soon as you put it in your inventory you will hear Meridia's voice say, "A new hand touches the Beacon. Listen. Hear me and obey. A foul darkness has seeped into my temple. A darkness that you will destroy". Meridia's voice will then go on to give the location of her statue. The Statue is located on Mount Kilkreath (map). As you ascend the steps to the Shrine, Meridia's voice will ring out saying, "A new supplicant approaches. Listen. Hear me and obey. A foul darkness has seeped into my temple. A darkness that you will destroy. But first, you must restore to me my beacon. I shall guide you unto it. Find it and return here. And great shall be your reward." This will add a marker to your map showing the randomized location of the beacon. "It is time for my splendor to return to Skyrim. But the token of my truth lies buried in the ruins of my once great temple, now tainted by a profane darkness skittering within. The Necromancer Malkoran defiles my shrine with vile corruptions, trapping lost souls left in the wake of this war to do his bidding. Worse still, he uses the power stored within my own token to fuel his foul deeds. I have brought you here, mortal, to be my champion. You will enter my temple, retrieve my artifact, and destroy the defiler. Guide my light through the temple to open the inner sanctum and destroy the defiler." At this point it is possible to ask about the artifact, but in any case Meridia will send you towards the ground with the words: "Malkoran has forced the doors shut. But this is my temple, and it responds to my decree. I will send down a ray of light. Guide this light through my temple and its doors will open." Once inside the Kilkreath Temple, the profane darkness is palpable everywhere as a thick, black fog oozes through the corridors and a burned desecrated corpse welcomes you. Proceed through the first corridor and notice the locked door on your left. It leads to a handle which opens the adjacent gate and gives access to some minor loot on the other side. Take the eastern path and face the first huge chamber. Meridia's ray of light will shine down through the ceiling onto a pedestal. Activate the pedestal and the beam of light will be directed onto a device placed above the eastern tunnel. When you follow the light, however, enemies will start to emerge. Dark shadows called corrupted shades will attack in hordes, trying to prevent you from bringing light to the temple. Dispose of them and enter the next chamber, then activate the pedestal to direct Meridia's light further into the depths of the ruin. The eastern path is blocked, so locate the narrow tunnel to the south, dispose of even more shades, and open the wooden door. Follow the tunnel until you see a chest, then take a left and enter yet another huge chamber with multiple paths and levels. The beam of light and the pedestal are located above, so head up the set of stairs to the right, notice the locked door (key required), then take a running jump to the ledge and activate the pedestal. The light will now point in a northern direction, so follow it to find an arcane enchanter and a locked door, once again giving access to a room with minor loot. Backtrack over the bridge where the door now will be unlocked. Go through it for a breath of fresh air. Once outside, you will notice your efforts have made three pillars light up, but there is still work to do. At the bottom of the stairs leading up to Kilkreath Ruins, to the right, is an expert-locked chest. Locate and enter the door leading to Kilkreath Ruins. Head up the stairs and enter a huge chamber with multiple levels and more corrupted shades. Kill the opponents and start your investigation by heading left into the chamber. The ground level has a few urns and an altar with another desecrated corpse on it, beyond a locked door (key required). Head back to the stairs near the entrance. At the top of the stairs is yet another door that needs a key, so go ahead and activate the first pedestal. This will open the east door behind you. In the first room down the corridor, there is a (spear trapped) door hidden in the shadows on the right. A desecrated corpse lies in the doorway, and the room contains a chest with minor loot. The main passage will lead the way to a lever (beware of the tripwire with swinging blades on your way). Pull the lever and go south over the bridge. Follow it until you reach an intersection, then take a right turn for the Block skill book Battle of Red Mountain. Backtrack to the intersection and make a running jump to the pedestal. Activate it, see the light shine towards a platform above, then jump back to the intersection. Make a running jump towards the now open western door and follow a tunnel to battle even more shades. You are now in a room with stairs leading up on both sides. The western one leads to a potion on a weight sensitive plate, the eastern one leads to a tunnel. Follow the tunnel and you will reach the last of the lighting pedestals. Activate it and the beams will be complete, opening the door at the ground floor of the previous chamber, leading to Kilkreath Catacombs. In the catacombs, make your way to the last pedestal and activate it. This will turn on the final beam of light, open the nearby door, and awaken Malkoran, the necromancer responsible for Meridia's wrath. Don't forget to loot the minor treasure chest in the corner, as the door will shut behind you with no turning back. Your journal will update when you reach the final chamber and it is now your objective to kill Malkoran. He is protected by six corrupted shades and is a strong opponent who uses frost spells from a distance, so use the columns to your advantage. When Malkoran is dead you will have to face his shade, so be aware. When all is said and done, Meridia will speak: "It is done. The defiler is defeated. Take Dawnbreaker from its pedestal." Loot the room before you retrieve the sword, as you will be transported outside as soon as you take it. When you finally retrieve the powerful sword, everything will turn into light and you will find yourself high above Skyrim once again, facing Meridia: "Malkoran is vanquished. Skyrim's dead shall remain at rest. This is as it should be. This is because of you. A new day is dawning. And you shall be its herald. Take the mighty Dawnbreaker and with it purge corruption from the dark corners of the world. Wield it in my name, that my influence may grow." Choose the polite answer and you will get the polite final words from Meridia: "May the light of certitude guide your efforts." Sometimes speaking to Meridia will not show a map marker for the beacon. 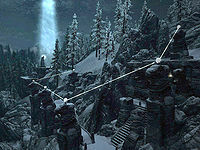 This is because the beacon is in an area you do not have access to yet, such as Dawnstar Sanctuary or the Katariah. The beacon still exists and finding it will advance the quest. On PC, movetoqt DA09 will place you at the chest that contains the beacon. Even if you are a vampire, Meridia will still recruit you for this quest and declare you her champion, despite her hatred for the undead. There are 43 desecrated corpses throughout Kilkreath Ruins that contain large amounts of gold. If you loot them all, you can get an amount of gold in the range of 1075-5375. Some of the desecrated corpses may also contain an Imperial Helmet (Full Face), a heavy armor helmet that you cannot craft. It is possible to kill Malkoran and the corrupted shades from the bottom of the staircase into the final chamber. This can help to even the odds of taking on a large number of enemies at once. 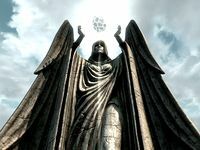 Meridia will teleport you outside the temple for your final dialog with her, and at the end she will deposit you on the platform in front of her statue. Any followers you may have will remain inside the temple. To get them back quickly, go to the door of the temple, enter it, and exit again. When you again appear outside, your follower should have rejoined you. Alternatively, if you have Serana as a follower, fast traveling to Fort Dawnguard will usually cause her to catch up with you. A word wall for Elemental Fury can be found just northeast of the base of the stairs up to the statue. Although the beacon will spawn in a specific location, that location will be changed the first time you enter an area that has a boss container after you reach level 12. This makes it very likely that you will find the beacon shortly after that time. The original location will only be used if you approach the statue before entering an area with a boss container. You can obtain a duplicate Dawnbreaker by knocking it off of its pedestal with an area-of-effect spell during the battle with Malkoran. Retrieve the sword on the ground prior to the sword in the stand to keep both. When you hang in the sky during the time you are supposed to be talking to Meridia after acquiring the sword, there's a strong possibility that nothing will happen and you will be left dangling in the sky, unable to complete the quest, or move anywhere. When you hang in the sky while talking to Meridia, she may suddenly drop you and you die when you hit the ground before the teleportation triggers. This is often caused by carrying too much weight. Try dropping a few things before taking the sword. 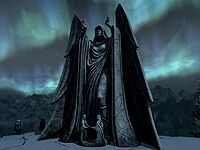 Walk towards Meridia as soon as she has lifted you into the sky, thereby dropping onto the area at the base of the statue instead of a longer drop further back. Skip through the dialogue with her and you will be able to adjust your position before the fall begins. You need to land on the upper area of her pedestal. The warp takes some time to activate. Try and position yourself over the lowest altitude position you can to maximize your fall time. The road to the southwest is a good choice. In the Windows version, a simpler and foolproof approach is to open the console when the fall starts, click on the background twice, so that no objects are selected, and enter TCL (or ToggleCollision), and exit the console. This stops the free-fall. After the teleport, open the console and type TCL again. If a dragon appears (or is already present) while you are being raised into the sky it will continue to attack, and you will be stuck in the air, as Meridia will not talk while under attack. You will need to reload a save game. If it was a random dragon it may not reappear. If it was the dragon from the nearby word wall, you will need to kill it first. Killing Malkoran in the hallway before the chamber and/or while he is paralyzed may cause his ghost to fail to spawn, making it impossible to finish the quest. Retry from a savegame, or simply wait for the paralysis to wear off before landing the final blow. ? If you have used Auriel's Bow to block out the sun there will be two suns after you give Meridia the stone. ? When fighting Malkoran's Shade, using the Unrelenting Force shout or werewolf power attacks will cause the shade to stop fighting. Unfortunately, it also ceases to take damage (the frozen shade can still be damaged by the Fire Breath shout and with Destruction magic). The shade just floats there, preventing the completion of the quest. If you have backed Malkoran into a corner at the side of the dais killing him, his Shade may spawn inside the wall where you cannot strike him. You can use Area Effect spells to finish him off, but you cannot loot the Shade. Sometimes, when you return Meridia's beacon it will appear on the pedestal, but the Beacon will stay in your inventory forever. ? Use the removeitem 4e4e6 console command to remove the Beacon from your inventory. Standing in the beam of light will slowly drain your magicka, but if you have an Alteration armor spell active (Oakflesh/Stoneflesh/Ironflesh, etc) then you will gain Alteration skill XP. It is possible for the two Meridia speeches to overlap each other. This issue has been addressed by version 2.1.1 of the Unofficial Skyrim Patch; a delay has been inserted into the trigger script to prevent this from happening. If you have finished the Dark Brotherhood quest line, the quest marker can appear where the boss chest was in the Dawnstar Sanctuary, but the chest will have disappeared. ? 50 An otherworldly voice coming from Mount Kilkreath is commanding me to find a beacon and return it. 100 I've found a strange gem. An otherworldly voice is commanding me to bring it to Mount Kilkreath. 300 Meridia has commanded me to enter Kilkreath Ruins, destroy Malkoran, and retrieve the artifact Dawnbreaker. I will need to guide a beam of light through the ruins which will open the way for me. 500 Finishes quest I have entered Kilkreath Ruins, destroyed Malkoran, and retrieved the artifact Dawnstar [sic], which Meridia has bestowed upon me for my service. The following empty quest stages were omitted from the table: 0, 1, 200, 400, 450. On the PC, it is possible to use the console to advance through the quest by entering setstage DA09 stage, where stage is the number of the stage you wish to complete. It is not possible to un-complete (i.e. go back) quest stages, but it is possible to clear all stages of the quest using resetquest DA09. This page was last modified on 15 March 2019, at 02:51.